In an update to the ASX this week, the lithium explorer processing technology specialist reported that test work on mine waste at Lepidolite Hill had seen it emerge as a strong contender to provide feed for the first 12 months of its SiLeach large scale pilot plant. Lithium Australia has an 80% stake in the old mine, 15km south of Coolgardie, as part of the Coolgardie Rare Metals Venture with Focus Minerals. 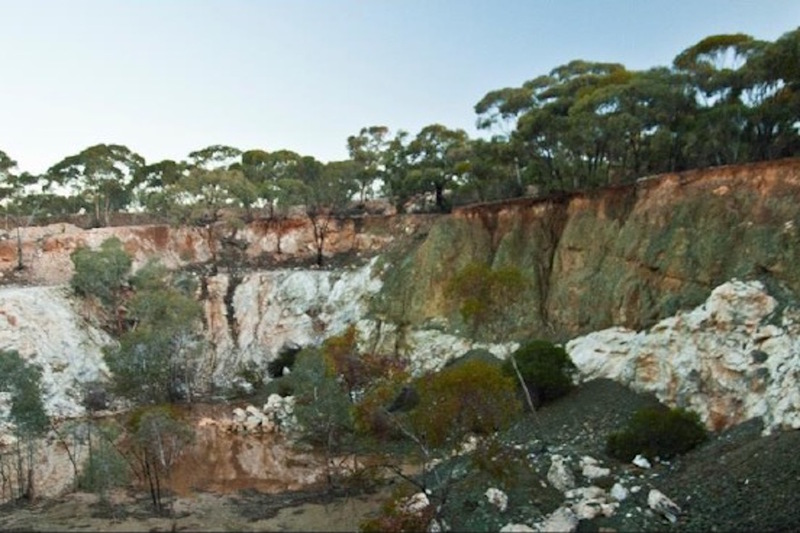 The lithium mineralisation at Lepidolite Hill consists of petalite and lepidolite in a thick pegmatite that remains exposed in the quarry walls. Further large lepidolite accumulations are exposed at surface at the southern end of the of the quarry. In the 1970s, petalite was recovered during mining operations and an abundance of lepidolite was also mined in the 400,000-tonne campaign but went straight to the waste dumps. That lepidolite is associated with accessory petalite, spodumene and pollucite. The waste ore at Lepidolite Hill is sub-economic and wont make anybody rich via conventional processing. Lithium Australia’s SiLeach process however is ideally suited to low-grade ore sources because it recovers lithium chemically and without the energy intensive roasting step which leads to a much lower cost curve than conventional methods. TOMRA Sorting Solutions recently achieved some excellent results from innovative ore sorting testwork on bulk samples of the mine waste material. The tests indicate the possibility of rejecting a large proportion of the waste material, thereby reducing the required capacity of the ore-preparation section of the large scale pilot plant. The newly recovered material will now be assayed to determine how the ore sorting process has impacted final grades. Further comminution and flotation tests will also be undertaken on the beneficiated product. The fact that Lithium Australia is even considering mine waste from Lepidolite Hill highlights the breakthrough opportunities created by SiLeach. Similar lepidolite occurrences are also under investigation as potential feedstock sources. Lithium Australia Managing Director, Adrian Griffin, said: “Lithium Australia is striving to improve the sustainability of the energy-metal sector. Recovery of lithium from mine waste is a great example of that, and we are strongly focused on opportunities in both Europe and Western Australia. "As demand for lithium grows, efficient resource utilisation will become essential. Our range of technologies allows us to seize opportunities as they arise, and that includes more than merely accessing mine waste – we're also developing the ability to rebirth used lithium-ion batteries. It's all part of Lithium Australia's plan to take greater responsibility for the stewardship of our finite resources." The company said it was in the final stages of engineering design work for the large scale pilot plant. A significant part of the funding for the plant and the recommissioning of a battery cathode materials pilot plant following the acquisition of the Very Small Particle Company was locked in last week via an $18.3m convertible note facility with a New York-based institution. All the pieces are falling into place for Lithium Australia as it morphs into a unique business that can take sub-economic mine waste that nobody wants and turn it into lithium-ion battery chemicals and cathodes – that’s pretty cool actually.